• The offer is applicable only on your first 2 cashless orders on Amazon. In order to be eligible to avail the cashback a customer should be placing their first Amazon order or should have only placed orders using Cash on Delivery or Pay on Delivery in the last 12 months. 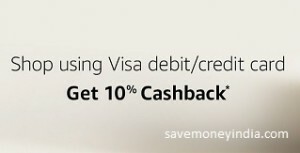 • Pay online using your Visa ATM card, debit card or credit card and get 10% cashback upto Rs. 100 on your first 2 cashless orders. • Offer Period: September 4, 2018 to September 30, 2018.